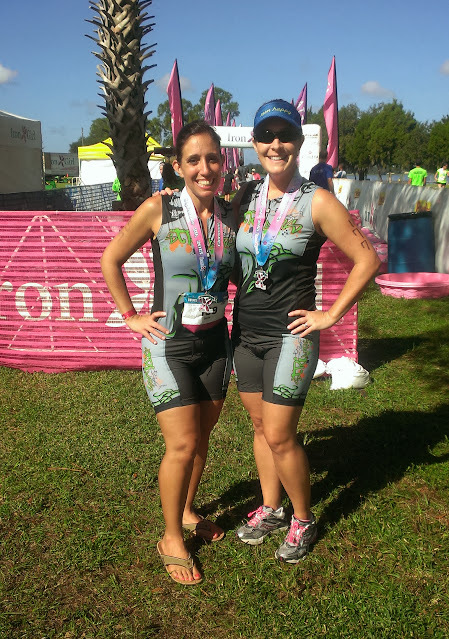 Disclaimer: I received an entry to Iron Girl Triathlon in exchange for an honest race report and my review of the race. The opinions and efforts shared are my own. 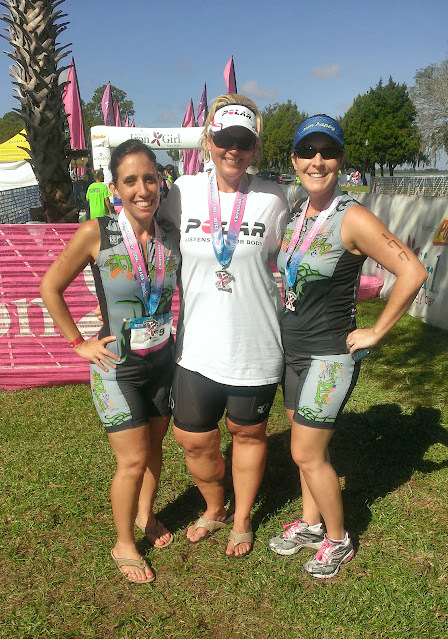 These were the thoughts that haunted me the week leading up to Iron Girl Clermont. I trained for months for this event, but somehow I could not wrap my head around swimming in a lake or cycling through the steep hills of Clermont. Although running or cycling would have calmed my nerves, I decided to conserve my energy, rest my muscles and not work-out the week before Iron Girl. Of course, that just gave me more time to think about brain eating amoebas. Thank goodness for mandatory swim caps! 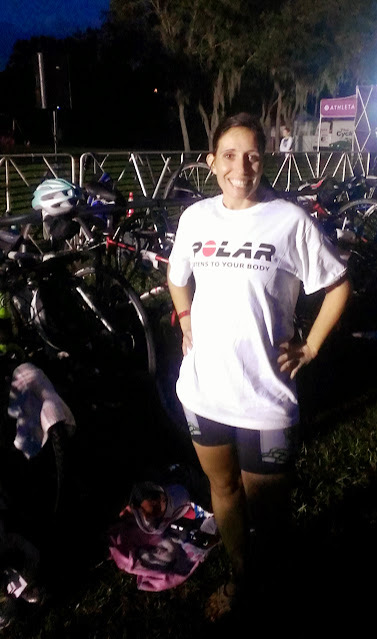 Chrissy, Jenny and I arrived Saturday evening for packet pickup and decided to rack our bikes overnight in transition. I love that the race officials offered the option to do this as it was one less thing to think about on race day. Once we arrived at transition, we saw the Lake Minneola for the first time. It was a real lake, one that stretched for miles, not like the sad swimming holes that attempt to pass for “lakes” in our neighborhood. Lake Minneola brushed up against a sandy shore, a sight that made me smile and the fact that I noticed no amoeba warning signs posted. We studied the transition set up to strategize our race day plan. Then, we drove the course so there were no race day surprises and I was so glad that we did. Those hills were intense! If I didn’t drown in the lake, the hills would surely kill me. On race day, we arrived at transition around 6:00 a.m., approximately an hour and a half to our swim start. The breeze off the lake made it a cooler than usual morning for us. Thankfully, Jenny lent Chrissy and I Polar t-shirts to keep us warm. Jenny and I started the swim at 7:33 and our seeded age group swim entered the water to proceed to the start line. Chrissy would start a few minutes after our wave. Due to the wind, the current was choppy and pulled us east. Given my struggle with the current, I predicted the half mile swim would take me approximately 20 minutes to finish. Once out of the lake, I ran back into transition. Just before unracking my bike, I spotted Jenny. She was all business with the bike leg. I ran out of transition ready to face the hills. I had a decent speed for the first couple of miles until I turned the corner onto Jalarmy Road and the first hill hit me like a wall. When a few cyclists and I turned the corner, we nearly fell over from the steepness of the hill. At that point, we conceded to its steepness, unclipped and walked our bikes up the hill. Other ladies stood on their bikes pushing their way up the hill. I cheered for them as the pushed and pedaled past me. As I struggled up that Are You Joking? Jalarmy hill and I watched others push through, I vowed to stay on my bike the remainder of race. I can do this. Make the sTRIders and Pura proud! So, on the downward ride, I hopped back on my bike and sat back in the saddle for the sweet speedy ride down hill. I managed the hills quite well, however, I decided to take the opportunity to play around with the gears. In hindsight, that was not my best decision because I couldn’t find the right gear. As I rode up the hills, my bike clickety-clacked like an old fashioned rollercoaster. 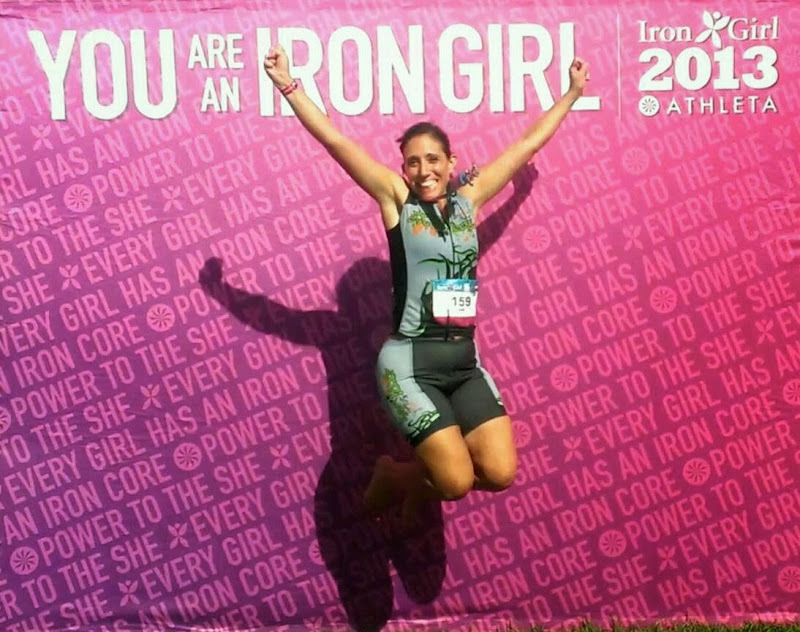 Throughout the Iron Girl course, I was never alone and I loved it. My follow Iron Girls and I cussed out those hills in packs. As we rode back towards transition, the pack became a little crowded as a few ladies tired and struggled, however, I found my second wind and pushed ahead of the pack. Back in transition, I caught up with Chrissy and we exited for the run together. I was thrilled to be nearly finished with only a 3 mile run remaining. Amazingly, my legs weren’t too tired or sore and I found myself running a decent pace. Chrissy complained about her shins and pulled back. Eventually, I passed Jenny. “I knew you would pass me on the run”, she called out as I ran by her. As I pulled ahead, I admired the view of Lake Minneola. It truly was a beautiful, scenic race course, even with hills. At the turnaround point, a young boy played Careless Whisper on a saxophone and I couldn’t resist singing along but perhaps realizing I was almost finished prompted me to sing. Compared to the other two legs, the run seemed to take no time at all and before I knew it, I could see the finish line. “Only a half mile to go!” A volunteer called out as we ran past. I did feel fierce and strong. I felt invincible. I survived a lake swim. I survived hills. As I crossed the finish line, the announcer called out my name, I proudly smiled from ear to ear. Today, I am a fierce Iron Girl. YES! Chrissy crossed the finish line a few seconds after me, but her overall time was way better than mine. I’m not sure how, but somehow, I wasted time in transition and lost over 4 minutes in transition. I think I dried each individual toe before putting on my socks. Stupid transition. My swim time was better than I thought but my bike time could have been a bit better. Although considering I was cycling 10 miles in nearly the same finish time only a few months ago, shows a huge progress for me. And with hills to boot! We all three did great and we really enjoyed ourselves. 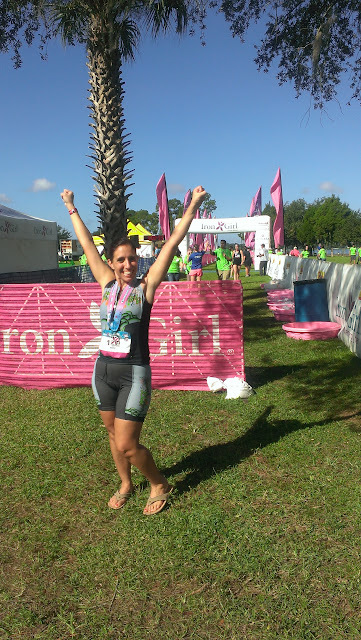 I would definitely compete in another Iron Girl Clermont Triathlon again but next time, I will be ready for those hills. I will stay clipped in Clermont next time! 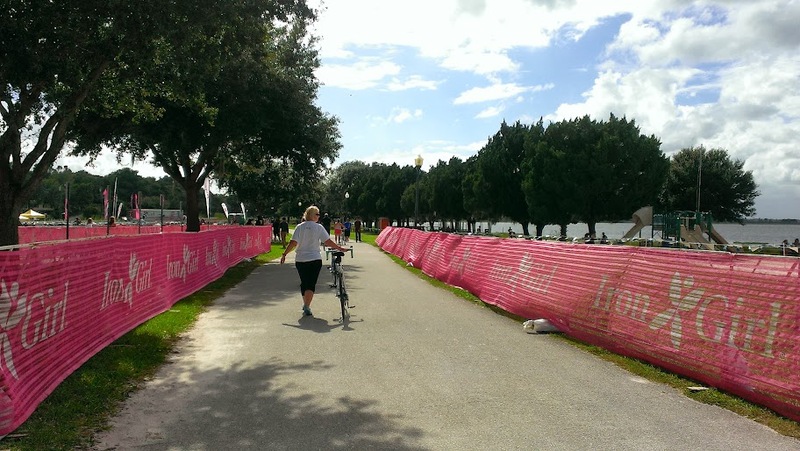 This entry was posted in fun, Life, review, running, sports, travel and tagged athletes, Florida, friends, fun, Iron Girl, Life, musings, recap, run, Run DMT, swim bike, thoughts, training, triathlon. Awesome job Denise. Sorry I’m late commenting. I checked for the recap for a bit and guess I somehow missed it. Congrats on surviving the amoeba and the hills and doing so great on the run! It’s amazing how much weight the run has on these triathlons. How did I miss this recap?? It was such a fun race and I loved biking with you over the summer to get ready for those hills! I hope that in 2014 I can do the 5K run without pain! !